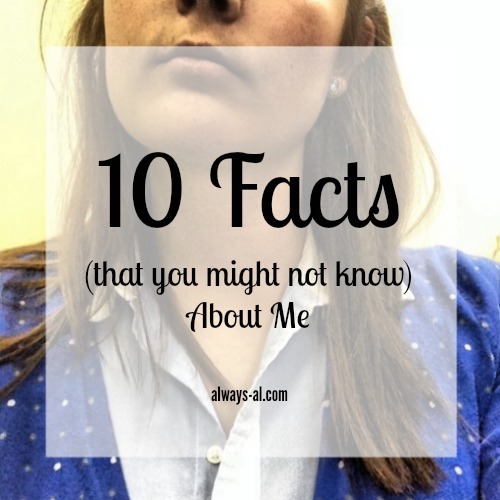 10 Facts About Me & A Giveaway! Hello everyone! I hope you all had a nice weekend! Mine included donating blood, drinking beer (oops!) and watching episodes of Rehab Addict on Netflix. I thought I would take today to share some facts about me, because there have been lots of new friends visiting this space lately, and it will be nice to share a little bit more about myself. Plus I always think that sometimes these are the best kinds of posts to read, because it gives you a look at the person behind the blog. ONE | My Meyers-Briggs personality type is INFJ, but I the difference between being a J and a P is very small. It would probably depend on the day. this kind of stuff fascinates me, and I love learning about personalities. According to this really awesome chart, I share personality traits with Remus Lupin. TWO | I love trying new beauty and hair products, but I am way too cheap. I have to put all of my regular maintenance products (shampoo, deodorant, makeup, etc) in my monthly budget. I especially love reading about "dupes" because 95% of my beauty products come from the drugstore. THREE | I really like to go to the movies by myself. It totally doesn't bother me to sit in the theater by myself, relax while seeing the movie that I want to see, and munch on a bag of popcorn. I've realized that when I tell people this, I get a split reaction. Some people feel the same, and probably also go to the movies by themselves, and then some people think that this is really weird and lonerish. FOUR | I always carry lotion in my purse and have multiple small bottles in my desk. Do I ever use it? Hardly ever. I mean seriously, never. FIVE | In college I studied voice and artistic administration. One of the questions I get the most often from family, friends and people that I meet in passing is why I don't sing, or why I didn't pursue a career in performance. There are two main reasons. 1. I am way too impatient. And 2. I am too much of a homebody to ever live a transient lifestyle that being a performance professional would require. SIX | I have a love/hate relationship with sports. I like to watch them, and I like to hang out with people (and eat!) while we are watching football/basketball/etc. But I could not care less about stats, players or any other detail of the game. I just like to watch because it's fun. SEVEN | I am an excellent parallel parker. I spent the whole summer before I turned 16 learning for my road test. My dad would put out two garbage cans and I would have to park between them without hitting them. I would spend hours practicing to make sure I passed, and I did on the first try. It is much easier these days with the back up camera on my corolla, but still. It's a skill. EIGHT | My Netflix account is super random. I like to watch the weirdest stuff ever. Today alone I watched Castaway, a documentary about people living on a dollar a day in the third world, and Rehab Addict on the DIY network. You'll also find a nice collection of period dramas, assorted documentaries and then weird reality tv. Not the normal kind like Real Housewives, but a&e kind. Like Swamp People and stuff like that. I just love it. NINE | I am a huge exagerator. You may or may have not noticed this when I explain things here on the blog. If something is in a large quantity, there is a million or a bajillion. Everything is either the best or worst thing ever. If I am sick, I'm dying. After giving blood on Saturday, I told Dave that that my arm felt like it was going to fall off. I really said that. I don't know how anyone takes me seriously. TEN | I am obsessed with reading celebrity memoirs. I've read a bunch so far, and can't wait to read more. I had different feelings on each one, but that is what makes them unique. I have some in my list, so I will be sure to share! I am so excited to bring this to you, lovely readers! I'm teaming up with a group of wonderful ladies to give away a Kindle Fire HD 7 along with a $50 Amazon gift card to one lucky winner! This is perfect to tackle your reading lists for 2015! We have the same personality type! And I am with you on the lotion- I can't stand being without it. Loved getting to know more about you! I always love learning more about the person behind the blog :) I do the same thing with lotion, I don't know why I keep buying it! Whoops, put the wrong blog I was entering from.. I must slow down. Love learning about those that I read. I love number 7. That is a hard one for a lot and makes people nervous. I remember I met this driving instructor in a bar one night in Myrtle Beach. We shared some cocktails and he gave me insight on how to park. To this darn day, I can parallel park. Best meet-up ever. I never went out with him. My friends and family no longer allow me to parallel park. I'm bad at it! For Christmas my Boyfriend got me monthly subscription to Birch Box and that is a great idea for trying new products. They just send you sample and you can decided what you like and get only what you already know you like! You should think about that. I am also proud of parking skills, but it's my backing in skill that I boast. I can back into almost any space anywhere and I love it. LOL! I love just driving in reverse altogether. Its weird. I would prefer to back into a parking spot rather than do it the "correct" way. LOL! Awesome facts Alex! Such a fun post. I laughed at 9 because that is definitely what I do. My family says I am over dramatic I prefer the word you used for it. I've always wanted to try going to the movies by myself. I think it's really good if you can enjoy your own company sometimes. Great idea for sharing more about you. i don't think it's weird to go to the movies alone. We can't talk anywhere. I loved your fun random things about yourself! I also enjoy going to the movies by myself. I even use to go to concerts by myself. What a great giveaway! I just entered! I'm either an INFJ or ENFJ, just kind of depends on the day (that makes me Remus and Dumbledore, score!). I love lists like this! I don't think I could go to the movies by myself, but I can totally understand the appeal! I have always thought about going to the movies myself but never actually did it. And, i'm also a pro parallel parker. It's so easy once you practice! !